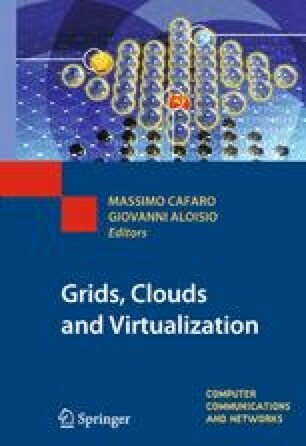 This chapter introduces and puts in context Grids, Clouds, and Virtualization. Grids promised to deliver computing power on demand. However, despite a decade of active research, no viable commercial grid computing provider has emerged. On the other hand, it is widely believed—especially in the Business World—that HPC will eventually become a commodity. Just as some commercial consumers of electricity have mission requirements that necessitate they generate their own power, some consumers of computational resources will continue to need to provision their own supercomputers. Clouds are a recent business-oriented development with the potential to render this eventually as rare as organizations that generate their own electricity today, even among institutions who currently consider themselves the unassailable elite of the HPC business. Finally, Virtualization is one of the key technologies enabling many different Clouds. We begin with a brief history in order to put them in context, and recall the basic principles and concepts underlying and clearly differentiating them. A thorough overview and survey of existing technologies provides the basis to delve into details as the reader progresses through the book. The authors with to thank Martin Walker for the insightful discussions on grids and clouds in the context of the SEPAC grid project; part of the materials of this chapter are based on one of his many interesting presentations.